It’s been a super long time since I did a craft swap (like 2009 with an ornament exchange long). So when I read about Jamie from C.R.A.F.T.‘s super cool Package Pals I had to sign up. And I had the awesome pleasure of being paired up with Kathryn from Destination Craft. You might remember I guest posted for her Grow Your Blog series a while back so it was lots of fun to meet her on this extra level. When I opened the box I literally squealed with glee I love love love the wreath she made me so darling right? I sent her a couple goodies including the headband above as well as a cowl I made using my 10 Minute Cowl tutorial and a feather rosette clip (tutorial for that will be up next week). It was so much fun making goodies for another crafty girl, spying in her Pinterest and riffling through her blog posts to try and get a feel for what she likes. And of course I had to share my excitement on Instagram since as many of you know I’m a bit obsessed. But yes I may have caught the swap bug and definitely will be doing more. I was actually thinking of doing a Bookish Craft Swap. Would any of you guys be interested? Let me know in the comments if that would appeal to you. 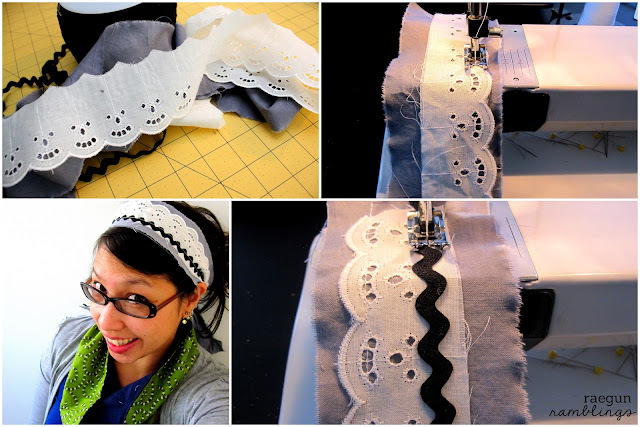 To make the headband you just need some eyelet, rick rack and a strip of fabric. I just do my base fabric 2 inches by 44 inches (or whatever the width of the fabric is). I just tear the fabric but you can cut it if you prefer. Then I cut the lace and rick rack to the same size and sew it down. Super easy! The headband is adorable. I love how it’s so simple to make – my kind of project! Cute! I would be honored if you linked this on my blog up at the Ginger Jamboree Link Party!! Love the wreath and the headband!! Marissa….this headband is adorable. Let me go through my scraps to see if I can make something similar…. Too cute! Hey Marissa. How are you? Another great idea, as usual. This is pretty. Thanks so much for linking up at Thriving on Thursday. So cute! I think exchanges are so much fun! The headband is so cute!! I’ve never done an exchange, but I’m sure it’s so much fun. I’m so glad you linked up at Romance on a dime. I featured you today, friend!